2. What Will Happen To My Country? This time I feel lucky once again for being introduced to projects I never thought I would discover (thanks Andrew Nazarenko), and the least I can do is to write a bit about it, because it simply deserves to create people’s attention. This is a project of Vladimir Gorashchenko, a veteran artist that has here gathers a magnificent blend of sounds and genres, providing to us, the listeners, a complex trip around the world. The album consists of five different compositions and a repeated track but sang in a different language. It opens with “Meditations”, a song that was actually composed in the late 80s but rearranged this decade. Here we can listen to the English version of it. I mentioned above this album offered a complex trip around the world, I think with this sole track we can notice it, due to the blend of eastern sounds (far and mid) and some nice rock elements. The song flows and shares a diversity of passages, some calm moments and some explosive ones in which the voice seems to be more emotional. Sometimes the tag neo-prog can be evident, but overall, I wouldn’t dare to tag the music, only progressive music, whatever it means to you. It is important to say there is a wonderful fretless bass here, which in my opinion is a very important element. “What Will Happen to My Country” is the shortest track, a 3-minute delicate song with piano and a disarming atmosphere that represents a contrast with the previous song. 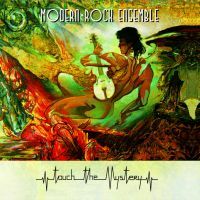 Now the longest one is “Touch the Mystery”, whose 20 minutes delight us with paradoxical passages, several changes and countless atmospheres created by the string ensemble. This is a challenging track, one magnificent composition that would easily be the album’s highlight, but what a highlight! It is impressive how the song flows in spite of its several changes, and it is delicious how new elements appear while the minutes pass and contribute adding new nuances and textures. There is a saxophone here and there, so there is an evident jazzy feeling. Keyboards is also a main instrument here, taking the leadership and making the direction of the music. There’s even spoken word here, so while the minutes pass the band keeps surprising us with the addition of new elements. Great! “My Angels” is another short piece that Vladimir dedicated to his wife and daughters. It is just like the second track, a soft piano solo piece in which the composer shows his love not only for his “angels” but also for music and life. Well, at least I could feel it this way. “Swamp” is the final track, and it is a different one because it was recorded live back in 1989, long time has passed indeed. This track is more in the jazz vein; its first moments are more experimental, then the addition of violin creates deeper atmospheres and the strings cover the composition wonderfully. The album finishes with the Russian version of “Meditations”, nothing new to add, but the language. A great and quite interesting album this is, not quite easy to dig, but highly recommendable for those who are seeking for a new prog experience.